Homemade Cherry Coffee Cake is a treat my grandmother used to make when I was growing up. I knew whenever I went to visit, homemade baked goods were in store. This homemade cherry coffee cake is easy to make and can be prepared in about an hour. One of the things I like most about making a homemade coffee cake is that it gives me a chance to get in the kitchen and prepare something people would normally buy at the grocery store. I have been into a large organic food push at my house, and with the exception of the cherry pie filling, I was able to recreate most everything with an organic equivalent. 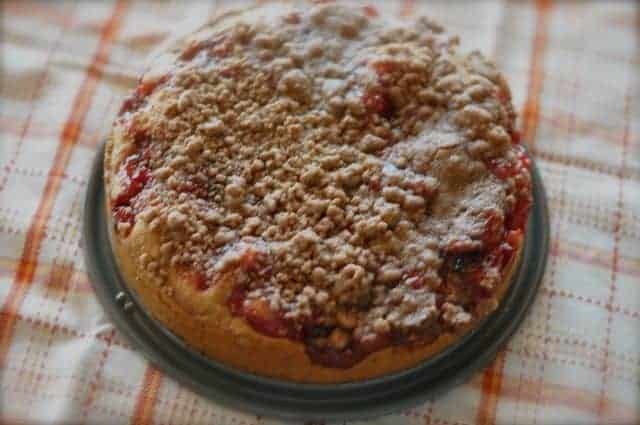 So enjoy this easy to make homemade Cherry Coffee Cake when you have friends over for coffee or make one this weekend! Homemade is always best, this cherry coffee cake is so easy to put together. In a medium bowl, combine 1 3/4 cups flour, baking powder, and 1 teaspoon of cinnamon; set aside. In a large bowl, with electric mixer on high speed, beat 5 tablespoons butter and 3/4 cup sugar until creamy. Blend in eggs and vanilla. On low speed, gradually add flour mixture alternating with milk until well combined. Spread batter into greased 9-inch springform pan; spoon cherry pie filling over batter. Bake at 350 degrees for 40 minutes. Meanwhile, combine remaining flour, sugar, and cinnamon. Cut in remaining butter until mixture resembles coarse crumbs; stir in water. Sprinkle over top of the coffee cake in the oven. Bake 15 to 20 minutes more or until a toothpick inserted in center comes out clean. Cool in pan or wire rack for 25 minutes. Remove outside ring of pan; serve warm or at room temperature. It says 2 cups of flour in the ingredients. Would this work with water instead of half and half? Or dark Turkish coffee?